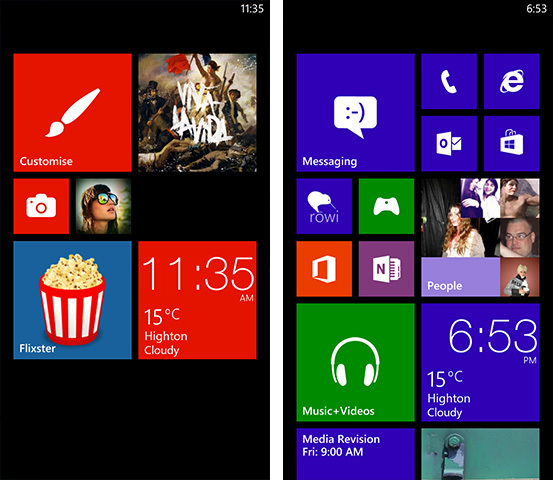 Windows Phone 8 is here, and finally consumers can get their hands on the latest and greatest from Microsoft. It's a seriously major change, the biggest since Windows Phone 7.5 "Mango" over a year ago, and it brings some critical new features that will keep the operating system relevant in the ever changing world of smartphones. In fact the change is so big that Microsoft required a whole new bunch of hardware to run the software, which not only brings the latest hardware tech to the table but also the platform for Microsoft to add whatever they liked without worrying about performance on legacy devices. The choice to support Windows Phone 8 only on new hardware disappointed a lot of people, especially those who recently purchased the Lumia 900, but going forward it will be the right choice. Here at Neowin I finally managed to get my hands on the Windows Phone 8X by HTC several weeks after the official launch, so I apologize for the delay in any hands-on impressions of WP8 and its new hardware. 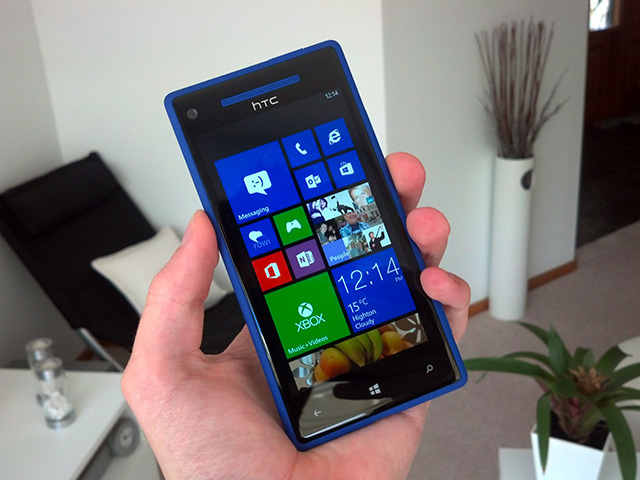 A huge shoutout again to MobiCity who kindly sent over the HTC 8X that allowed me to review Windows Phone, so check them out whenever you're thinking of buying a new phone (perhaps a new Windows Phone?). Anyway, look out for a review of the 8X shortly, but for now let's get stuck in to Windows Phone 8 and what new features it brings. 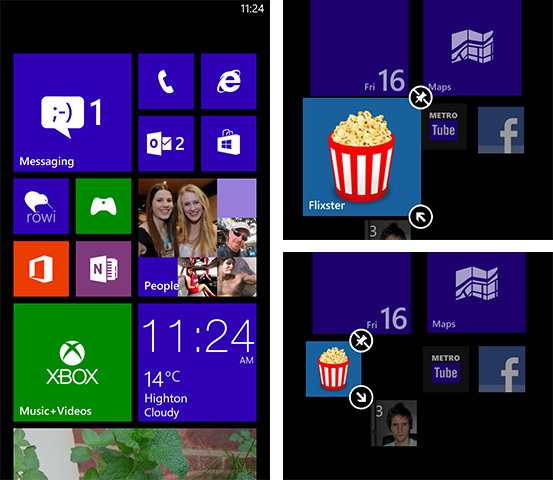 When you start up your Windows Phone 8 device for the first time you'll most likely notice the new and improved Start screen, complete with three sizes of tiles. Visually this is the biggest change to Windows Phone 8, as the Metro/Modern style complete with large text headers, left-right swiping panes and tiles remains exactly the same. 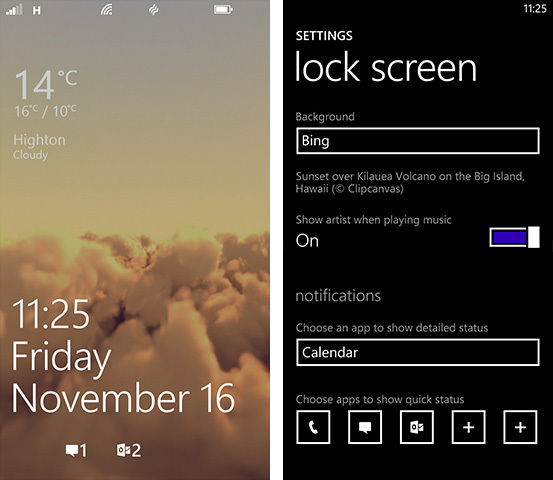 Back in June when we first got a peak at the new Start screen for WP8 I thought that it looks very cluttered, but now that I have actually used the layout it's just so much better. With Windows Phone 7 there was a limited amount of information that could be displayed at once on the Start screen without scrolling, but with the new smaller tile option there can be so much more information available at a glance - and that's what Windows Phone is all about. Where not all apps support the extended width tile, everything supports the small tile either with just a simple app icon or a Live Tile notification. For example on my Start screen setup I chose to have the email app as a small tile, and just like the larger messaging tile beside it, unread message counts are displayed whenever I get a new email. Even better is the improved customizability of the Start screen, which allows you to choose whether to use the smaller tiles or not. If you prefer how Windows Phone 7 looked, you're welcome to set up your Start screen like how it was in the past, or you can fill it up with loads of small, medium and large tiles arranged in some cool fashion that suits your needs. Plus, there's more colors to choose from, which is always nice. The lock screen has also received more options for you to salivate over, including the ability to customize which apps display notifications on the lock screen just like in Windows 8. You can set up five quick app notifications and one additional one for detailed information; you may choose to display a Facebook and Skype notification count alongside unread messages and emails on the lockscreen, while having the calendar display an upcoming event. The aforementioned lock screen notifications are powered by so-called "Live Apps", which can also deliver another source of information to the lock screen. Apart from the option to have a standard photo as a lock screen background, you can choose to have select applications deliver info straight onto the lock screen background similar to a live wallpaper in Android. 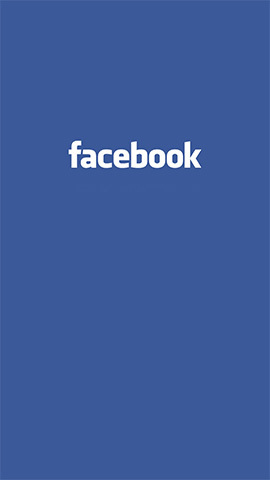 One option on the HTC 8X is to select "HTC" as the background, which shows you weather information for your location right on the lock screen, but apps such as Facebook can display a selection of photos as something different. When it comes to it these additions are quite small, but they drastically improve how you use your smartphone and how quickly you get important information, all the while making your smartphone more "smart". I absolutely love how I can tailor make an experience in Windows Phone 8 that is exactly how I like to receive my information, while hiding stuff that I don't necessarily need. The added support for multi-core chipsets is a big one, because not only will you see a huge speed increase in Windows Phone hardware, but these chipsets also support numerous advanced features. Qualcomm's Snapdragon S4 Plus and Pro chipsets easily support 1080p hardware encoding and decoding, so you'll now be able to record and playback 1080p content on your Windows Phone. There's also better support for LTE radios and the latest Bluetooth and Wi-Fi specifications, as well as the ability to include larger cameras and better video out. It also may surprise you that most multi-core chipsets are significantly more power efficient than last-generation single-cores, so power consumption can even be reduced despite the increase in speed. 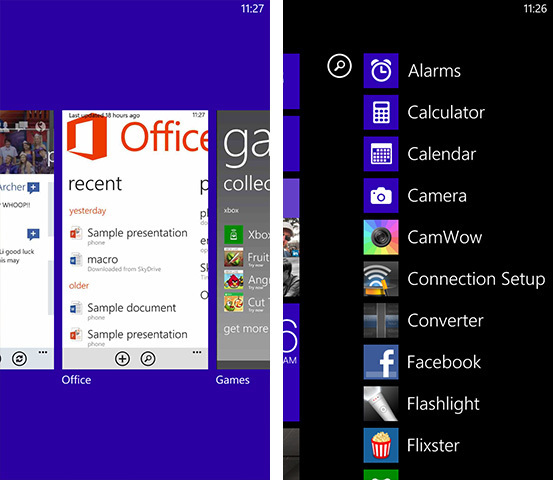 But enough on what Windows Phone 8 can support, more on how exactly it feels to be used. Keep in mind that any of the following performance impressions are based on my experiences with a Windows Phone 8X by HTC, but I'll be sure to check out some more phones to ensure it's the same across all new devices. Windows Phone has always been a platform that you know is going to be absolutely buttery smooth to use, and WP8 is no exception to that rule. However, using WP8 side-by-side with Windows Phone 7 it's clear that the improved hardware is working wonders for the speed of the device. Everything is just that bit more responsive, more quick, more accessible and more fast to open. Some menus on single-core WP7 hardware are laggy, especially in the camera interface, whereas with WP8 it's now incredibly smooth despite the increase in features. Apps load in no time at all, and animations are rendering at a fluid 60 frames per second without even thinking about slowdowns. If you thought Windows Phone 7 was smooth to use, you'll find Windows Phone 8 is an obvious step up in speed, and it generally makes the entire experience more of a joy to use. Naturally there are some hiccups around the place, and I have experienced slowdowns, but not only have they been few and far between but I feel like a simple update could easily address any performance issues in the first batch of hardware. Even better is that Microsoft is still focused on delivering a fantastic experience to the end user, adding some great new features without any compromise in performance on the new hardware that is available. 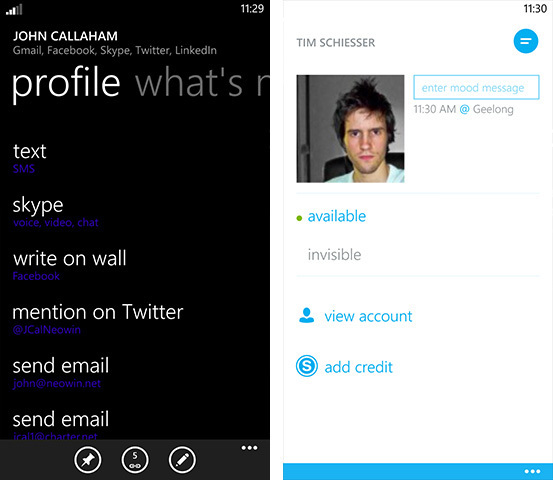 The core experience of communicating in Windows Phone 8 remains very similar to Windows Phone 7. The People Hub is your go-to zone for everything related to your contacts, including status updates and photos from your connected networks, plus a history of communications with your mates. This Hub is complemented by a number of other apps, including the dialer, messaging and email apps which all have essentially unchanged functionality. However, there have been a few updates here and there to the methods you can take to share your stuff with your friends, and the new Rooms feature is one of these. I find it interesting that Microsoft included both a Rooms and a Groups feature inside the People Hub as the naming can be a bit confusing, but their functionality is quite different. Groups is basically a collection of people where you can quickly see their status updates and photos, with quick options to email or message them all. Rooms are similar, but with expanded functionality designed for easy communication between a bunch of people. 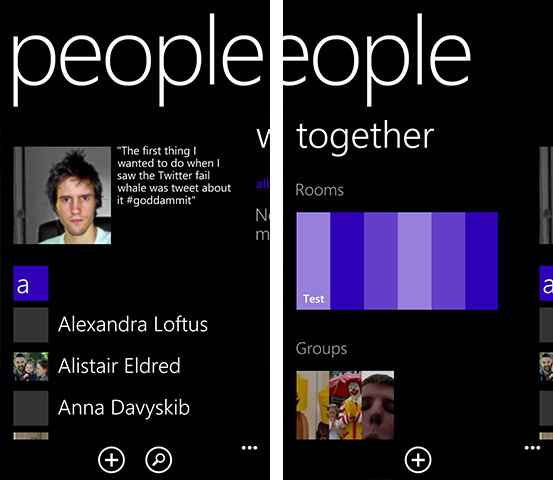 Unlike Groups, a Room is invite only and appears on the phones of anyone added to the Room, provided of course that they're running Windows Phone 8. Inside the Room you can chat easily with all the other members, as well as share calendars, notes and photos really easily. 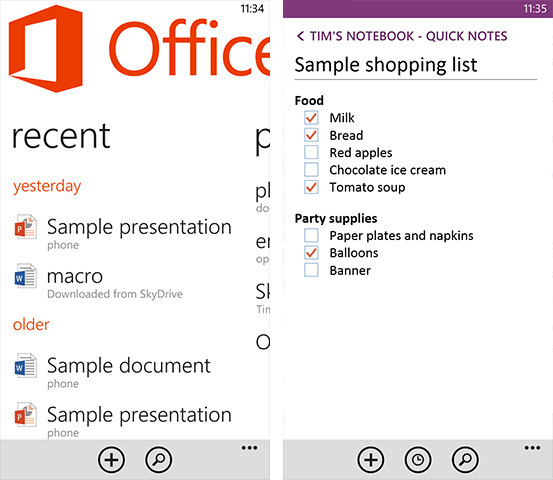 By default there is a family Room included in WP8, which would be extremely handy to organize get-togethers and put stuff on shared shopping lists. The main problem with Rooms is that the experience only works optimally if everyone has a Windows Phone 8 device, and currently I know no-one else with a WP8 handset because you can't actually buy one in-stores in Australia yet. 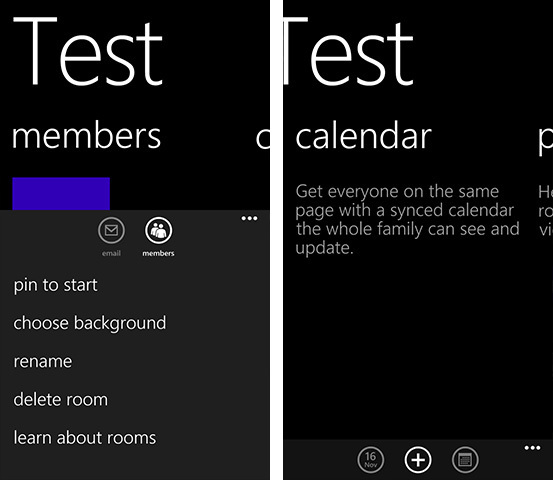 You do have the option to add non-WP8 users into your Room, although they won't be able to chat and shared calendars apparently only works with WP7 and iPhone users. It would be seriously awesome if everyone I knew was using a WP8 phone so I could easily organize events that don't clash with my friends' schedules, and chat with them about recent events. However the functionality is very limited at the moment due to the extremely small marketshare of Windows Phone 8 compared to Android and iOS, basically ruling out Rooms as a feature that I will use in my daily routine. The other major improvement that comes to the communication capabilities of Windows Phone 8 is the baked-in integration of Skype and other VoIP & video chat services. Incoming calls are directly integrated into the Dialer and so come in like a regular cellular phone call, and a number of options are integrated into the People Hub so you can easily set up a chat or call with a contact. Battery life is also saved thanks to the way Microsoft stores your online presence in the cloud rather than on the device itself, allowing a basically drain-free additional service. After you install the Skype Preview app from the Store you'll see just how good the integration of Skype is in Windows Phone, as you would expect from a Microsoft-owned service. Finally, there's also NFC in a lot of the new Windows Phone 8 devices, bringing Tap+Send sharing capabilities. While Android automatically detects two NFC devices for sharing, with WP8 you have to select to share something through Tap+Send to activate NFC sharing, and then touch your device on another to complete the digital transaction. It's a little bit cumbersome but it works perfectly well with other devices including Android phones and Windows RT tablets, in both directions. Microsoft has been touting Internet Explorer 10 as one of the major new features to come to Windows Phone 8, and it certainly does bring a lot of performance improvements including drastically better HTML5 support. Bar a few things here and there, IE10 on a Windows Phone device is very similar to that on a Windows 8 device, right down to the Trident rendering engine, SmartScreen filter and Do Not Track (the latter two are disabled by default). Using IE10 feels very fluid and very fast, which is probably a combination of a better rendering engine and the improved hardware that Internet Explorer runs on. Tabs apparently run in separate processes to prevent one crash taking down the entire browser, although this does unfortunately limit the amount of tabs open to six. That said, with six tabs open, switching between them and browsing was just as fast as having one tab open. With IE10 you can now choose the button that appears alongside the address bar at the bottom of the display, meaning you can switch out the relatively unimportant refresh button for a tabs or favorites button if you prefer quick multi-tasking. There's also an option for having websites display desktop versions by default, which is something that I prefer as mobile sites these days can be a tad rubbish. 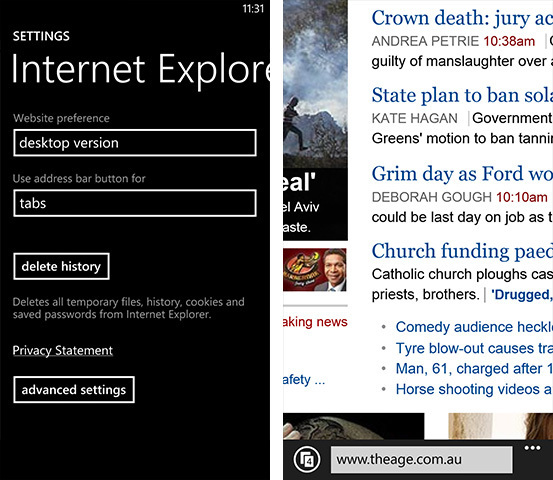 Despite all the improvements to the browsing experience in Windows Phone 8 there are still some things that aren't so great. The way Internet Explorer 10 in WP8 renders websites has come along way since I last had hands-on time with a Windows Phone, but the rendering of fonts can look extremely strange on some websites compared to how I see it in Windows 8's IE10 on my desktop PC. Fonts is just one example of strange rendering that I've seen in IE10 in WP8, and it can probably be blamed on the prevalence of WebKit browsers in the mobile and desktop spaces at the moment. Developers clearly favor WebKit browsers over others such as IE10 and Trident, which can cause dodgy rendering at times when it probably shouldn't. Sure, there are a lot of websites that do look fine, but there's the occasional bad one that you just don't get in Chrome on Android. Microsoft can't be expected to go and specifically modify their engine so everything on the entire internet works perfectly, so we'll just have to rely on web developers to ensure that websites render correctly across all browsers, including Internet Explorer 10 for Windows Phone 8. 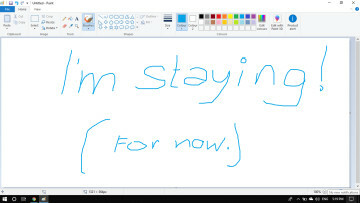 Just like with the new Windows RT, and Windows Phone 7 before it, Windows Phone 8 comes with a full Office suite that has the capabilities to create and edit documents on the go. Compared to Office on WP7, the major changes mostly rely around re-badging with the new logo and the split of OneNote from the main suite: you'll be wanting to use OneNote as your note-taking application as it's a really solid piece of software, and now it's a simple tap away on your Start screen. 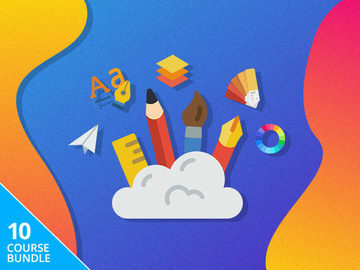 The ability to create full Word and Excel documents remains and has been tweaked slightly, however there is still only a basic editor for PowerPoint presentations: you can watch your presentations stored in the cloud, and edit some text but that's basically it. And just on the cloud integration in Office, it's really fantastic; SkyDrive and Office 365 documents are immediately pulled into the application for easy access, so there is basically no sidesteppping or management needed to find the files you want to work on. 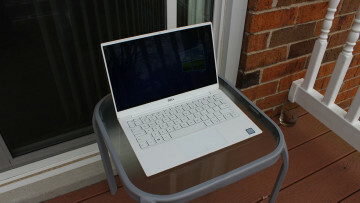 You'll also find SkyDrive integration around the OS in other places, such as the ability to auto-upload photos to SkyDrive, upload straight from the gallery or camera apps, back-up of apps and settings and the ability to upload music as well. It's all complemented by a great SkyDrive app which you can find in the Store. The inclusion of the Kid's Corner is quite innovative of Microsoft, as I'm sure there are numerous times when your kids have asked to play some games on your phone, and you'd rather not have them accidentally mess around in your personal data. And even if you don't have kids you might find it useful when someone asks to use something on your phone (for example YouTube), and you'd rather not have them mess around elsewhere. 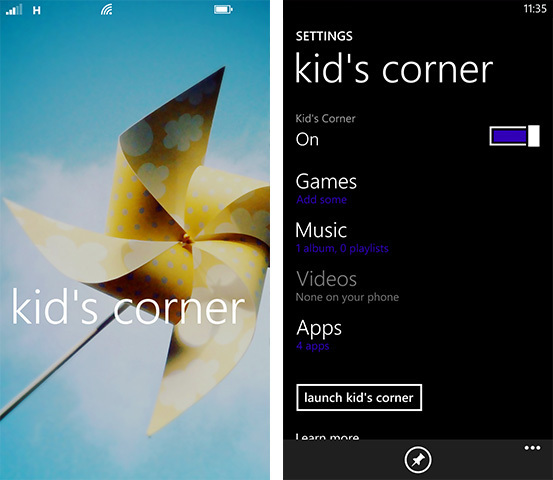 By default there's a Kid's Corner tile pinned to the Start screen, although the service itself is disabled until you go choose to set it up. Once you've chosen a few apps, games and perhaps some videos or music to let your kid have fun with, the Kid's Corner can be activated by swiping right-to-left on the lock screen. There, they can access any of the stuff you've added to the Corner, and even customize how it looks with their own Start screen layout and highlight color. All notifications aside from incoming calls are invisible to those using the Kid's Corner, so your little ones can enjoy their gaming without being interrupted, and you can have the peace of mind they might not access anything personal to you. While I don't have kids to make use of the Corner, I think it's a really cool addition to Windows Phone that's outside the box of a traditional smartphone feature set. I'm not going to sugar coat this in any way: the Wallet experience for someone living outside the United States is currently terrible. 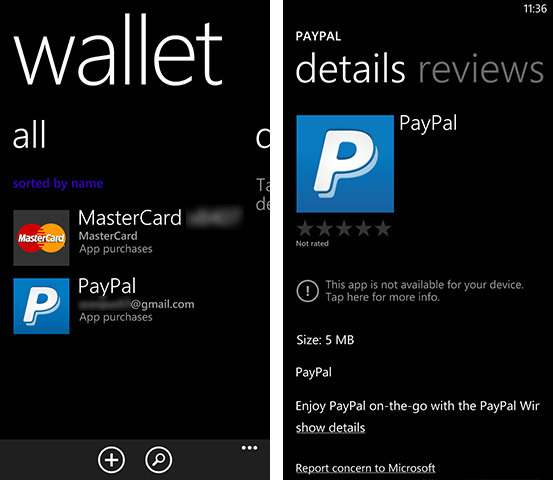 The idea behind the Wallet Hub is that you can easily collate information related to your credit/debit cards, PayPal and loyalty programs, easily find deals near to you, and tap to pay for things via the NFC capabilities in many new Windows Phones - but as an Australian not many of these features work. The first thing I did in the Wallet Hub was add both my PayPal account and debit card, which is nice because I can now use either for purchasing apps in the Store, but that is literally all I can do. There is no app in the Store for my bank so there is no Wallet integration there, and for some reason the PayPal app is "not available for your device" despite the Wallet Hub directly linking to the correct app. Theoretically I should be able to see my account balances and transaction history, but no such luck. Then there is the deals pane, which according to Microsoft's own instructions should have the ability to find deals near my current location. After pressing the Add icon, there apparently should be a button for "Find deals" except there is no such option here; this means the only type of deals I can add are manual ones, which is a complete waste of time. Don't worry though, because I've heard these features work well in the United States, it's just a shame that the experience is not complete in other locales such as Australia. In the future I hope my bank will support tap to purchase using NFC as there are a lot of NFC-capable point-of-sale machines here, but until then I'll give Wallet a miss. 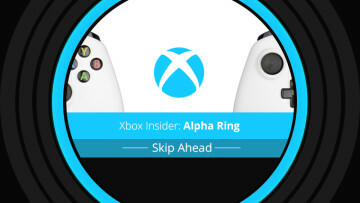 Just like with Office getting a new logo in Windows Phone 8, Xbox takes the reigns from Zune without adding a great deal of new features into the mix. The Music+Videos Hub is still the center for everything multimedia related on your phone, as it collates not only the content you've stored on your phone, but also media related apps will appear here such as MetroTube (for YouTube). 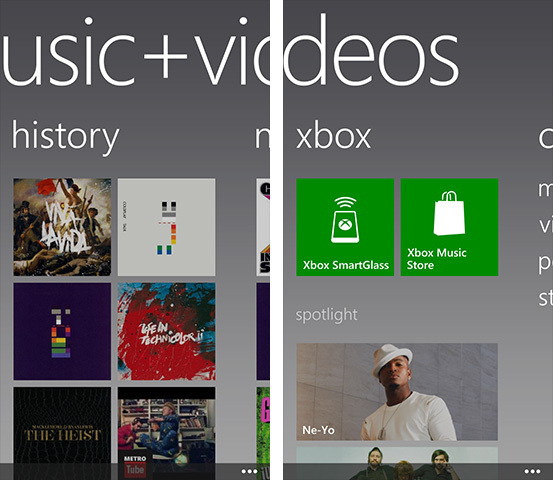 Previous owners of a Zune Pass can go ahead and use the Xbox Music Pass without any fuss, downloading and streaming unlimited songs as they please. If you don't have a Music Pass there is also the standard Music Store where you can purchase DRM-free songs just like with iTunes and other competing services; and of course you can dump any songs you already own on the device and the Hub will be the place to play it. 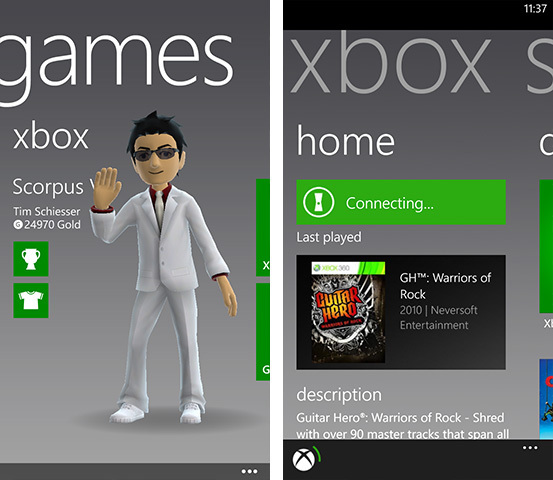 Apart from the Music+Videos Hub the Games Hub also appears on WP8, and it brings all the features from WP7 with it such as viewing your Xbox LIVE achievements and friends, as well as collating games you've downloaded including those with Xbox achievements (one of the cool things about Windows Phone gaming). New to Windows Phone 8 is the SmartGlass app which integrates with the new Xbox 360 Dashboard update to bring control of the console in certain circumstances, such as using IE10 and controlling whatever media you might be watching on the system It doesn't have quite the same feature set as the Windows 8 version, but it still managed to control my Xbox 360 with only a small delay, and the app itself is much more fluid than the Android version I've tried previously. All the Bing features introduced in Windows Phone 7.5 are still available in WP8 as you would expect, including standard Bing Search, Bing Vision, Music Search and Local Scout, the latter of which actually shows local businesses in my location for once. 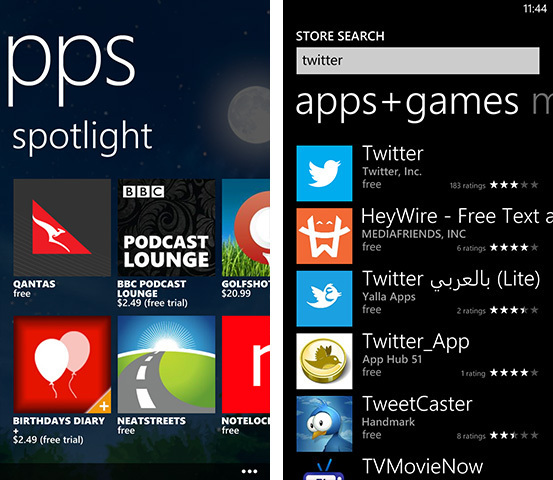 None of these apps appeared to receive any major update in WP8, but they were pretty good to begin with so we can't really complain. 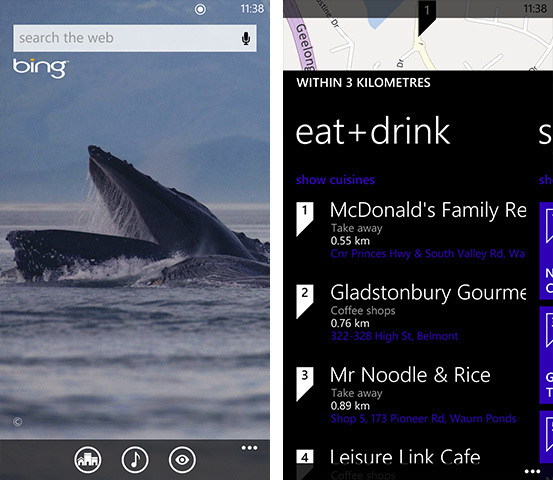 The final Bing app that is included on the phone is Bing Maps, which is now powered by Nokia's mapping technology. 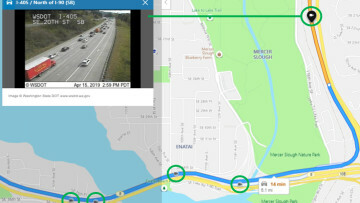 The biggest advantage to this is you can download maps for offline use on any Windows Phone device, which is particularly useful if you're travelling overseas without any data access. I also found that since the last time I picked up a Windows Phone, the search has improved so it now actually finds the closest McDonald's when I search for "McDonalds". However compared to the maps offerings from Google on Android, Maps on Windows Phone 8 is seriously lacking and very average. Despite the search improving as I mentioned, it still doesn't find everything that you search; for example I could search for "KFC" and it will only find two out of many KFC locations in my city. If I search for "Westfield" - a major shopping center in the CBD of my city - it puts the marker four blocks away from the location which is labelled on the map. I also found some pretty major flaws with directions in the Maps app. If you press the directions button and type in a destination it will provide you directions without a fuss, but if you search for the same location, tap on the marker and select "directions from my location" it asks you to search for an app in the Store to perform this action (and of course there are no apps available). This is completely ridiculous if there is a built in navigation option within the app that it could use, but for some reason doesn't. It's also irritating how there is no turn-by-turn navigation option available in the Maps app, a feature which both Android and iOS include in their mapping apps for free. Not really a problem if you get a Nokia Lumia with Nokia Drive bundled on the phone, but it would be nice on some other phones such as the HTC 8X as well. Maps really is one of the few features of Windows Phone 8 that feels rough and unpolished, as if Microsoft tried to get things working right but then gave up half way through. 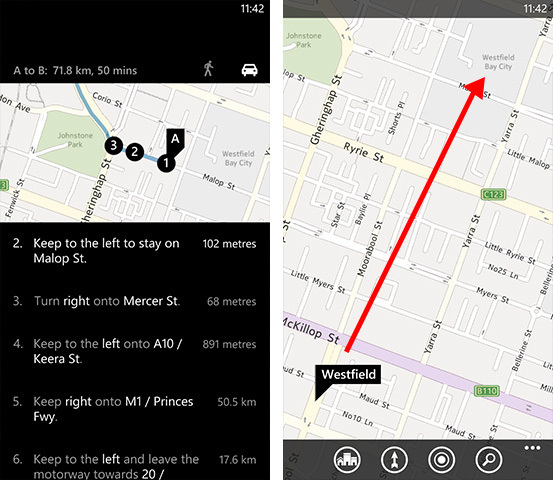 If WP8 gets a feature update soon I'd love to see them put some work into Maps to get it to a good standard, because it's mediocre to use in its current state. The camera interface has received some minor improvements in Windows Phone 8, namely the easier accessibility of functions such as the flash, and the removal of the digital zoom buttons in preference of pinch-to-zoom (not that you should digital zoom, ever). The major improvement lies with Lenses, a cool ability that can be activated straight from the camera app that allows for applications to augment the camera feed however they see fit. The 8X only came with Bing Vision, which can also be activated through Bing Search, although there were a few third-party apps available to add to the Lenses - I tried CamWow, which adds a number of live effects to the camera preview for photography. All photos taken with a Lens can be directly and automatically uploaded to SkyDrive (if you have the option enabled), and the photos will appear in your camera roll in the gallery app just like any other photo taken with the camera. Alongside Bing Vision that came on the 8X I used for this review I believe there should also be a Photosynth Lens for panoramas and a PhotoStrip Lens for burst shots, although I'm not sure when they will become available. 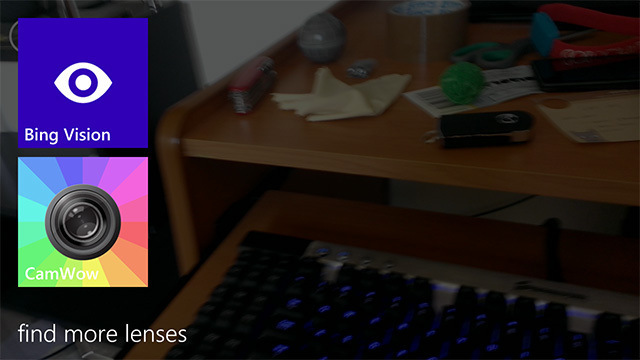 In the future, expect to see a lot of apps take advantage of the Lenses section in the camera app. Despite the fact that Windows Phone 8 doesn't support third-party keyboards, the one that's included is so damn good that you won't feel like that's an issue. The keys are a perfect size, and the autocorrection works without being too aggressive, making it an incredibly easy keyboard to pick up and start using. I would like to see a quicker way to enter numbers and some critical punctuation aside from a full stop or comma, but that's really the only complaint. The lack of a proper notification center I initially thought would be an issue, and although it would be nice to have one, it isn't really a big deal when it comes to it. In most cases, and certainly for me, all your favorite applications and the ones you want to receive notifications from are already pinned to the Start screen, displaying a Live Tile. If you get a toast notification and forget about it, whatever app that sent it will be displaying a notification in its Live Tile, negating the importance of a notification center. One area I could think a notification center might be handy would be when you're inside an app and you want to check your notifications, similar to the pull-down menu in Android. 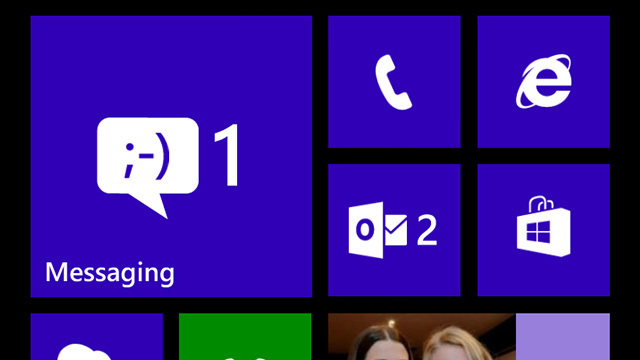 But, as I said, a simple check of your Start screen should reveal all your notifications and thanks to multi-tasking in WP8 you can jump straight back into whatever you were doing. Even though every Windows Phone comes with a dedicated search button, it's strange that this button is not contextual and always opens Bing Search. You would think that in an app with a search feature, such as the Store, that the hardware search button would search inside the app, but this isn't the case. In the end, apps are wasting space having to display a search button on-screen when there's one on the device, and as you don't always need to search the internet the button becomes underused. For those of you that rely on Gmail rather than Outlook.com (or another Microsoft email service), it is actually possible to get push email if you set up the account as an Exchange ActiveSync account rather than a Google account. It's also possible to get multiple Google calendars to display, although it requires some hacking. 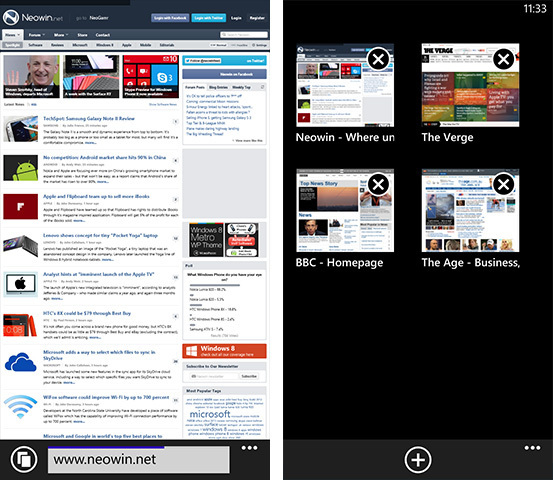 It's safe to say Google integration in Windows Phone 8 is strange, something which I'll explore more of later. A data usage tracker known as Data Sense is coming to Windows Phone 8, although it's up to your carrier whether it will be included on your device. It wasn't included on my device so I couldn't test it, although I hear it's coming to Verizon in the States first. Also, WP8 includes the ability to take screenshots for the first time, which you can activate by pressing the Start and power buttons at the same time. It's really easy to get working and delivers high-quality images, and without it the images used in this review would not be as good, so it's great to see Microsoft has finally included this feature. 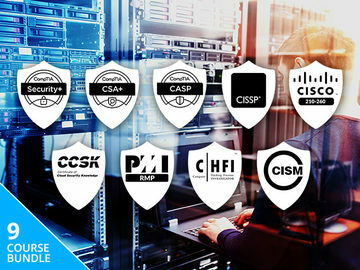 As you might expect from an operating system with a small marketshare, the selection of third-party applications is reasonably small at the moment. The Store does actually pack 100,000 apps inside, but a large portion of those you couldn't actually class as quality, so in some ways Windows Phone 8 feels like quite an immature operating system. This will probably be a problem for anyone jumping ship directly from Android or iOS and their massive app collections. I did manage to find substitutes for most of the applications I used often on my Android daily driver, but pickings are a little slim and even slimmer on the gaming side of things. Luckily, as Windows Phone 8 brings native code support for the first time, it will be easier than ever for developers to port all the goodness straight to Windows Phone. The good news is Microsoft is going all out to ensure that Windows Phone is a success, enticing developers to deliver quality applications to WP8 - and the goods are already beginning to trickle through, as seen in the same-day release of Angry Birds Star Wars to the Store. In just a few months it's not hard to imagine a WP Store that's considerably better than it is now, but of course that's all up to the developers. I'm not really thinking of this as a two-year old platform, but as a two-week old creation that needs time to grow. Under the hood, Windows Phone 8 is so different to Windows Phone 7, bringing numerous improvements to the capabilities of the operating system, that it's surprising it works so smoothly as it does. Give Windows Phone time and the ecosystem will flourish, especially with Microsoft's introduction of a similar interface in Windows 8/RT. It's your choice whether you become an early adopter, or whether you look at how WP7's ecosystem turned out and understandably pass; but if you jump in head first you might really like how it turns out. 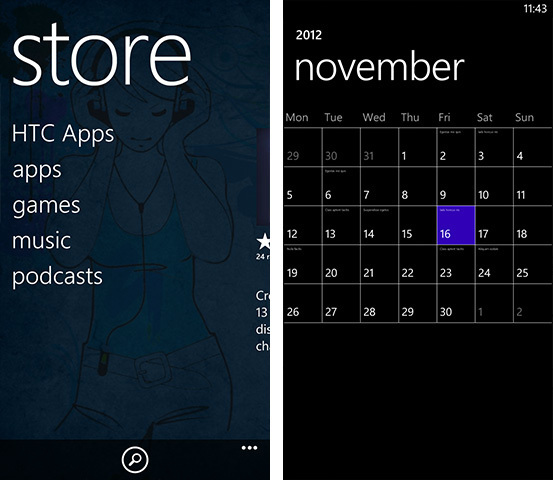 There's no denying that Windows Phone 8 is a large step forwards, both in terms of features and Microsoft's mentality. The new Start screen is absolutely brilliant at displaying information, and the ease of use is second to none combined with hardware that can actually be relevant in a modern smartphone world. Microsoft has addressed some key areas with WP8 and done one huge catch up, and there can only be innovation from here. Naturally there are some niggles along the way that may be off-putting to potential WP8 phone buyers, including a dodgy Maps app and an imperfect browser, but overall I would actually be happy to use a Windows Phone. There is no way with Windows Phone 7 or 7.5 that I would have been happy using that OS every day, but with Windows Phone 8 I can actually say it meets (and exceeds) my needs in smartphone software. The selection of apps available currently is of a concern and will be a concern for anyone who chooses to buy a Windows Phone in the next few months. If you go ahead and get a phone like the Lumia 920 or HTC 8X be prepared for an early adoption experience on an OS that's already technically two years old, but you might not necessarily find it all that bad: I certainly didn't. With a bit more marketshare and a solid collection of applications in the Store, Windows Phone 8 will be a mighty force to reckon with in the mobile space. → Buy yourself a Windows Phone at MobiCity - they have them all unlocked!